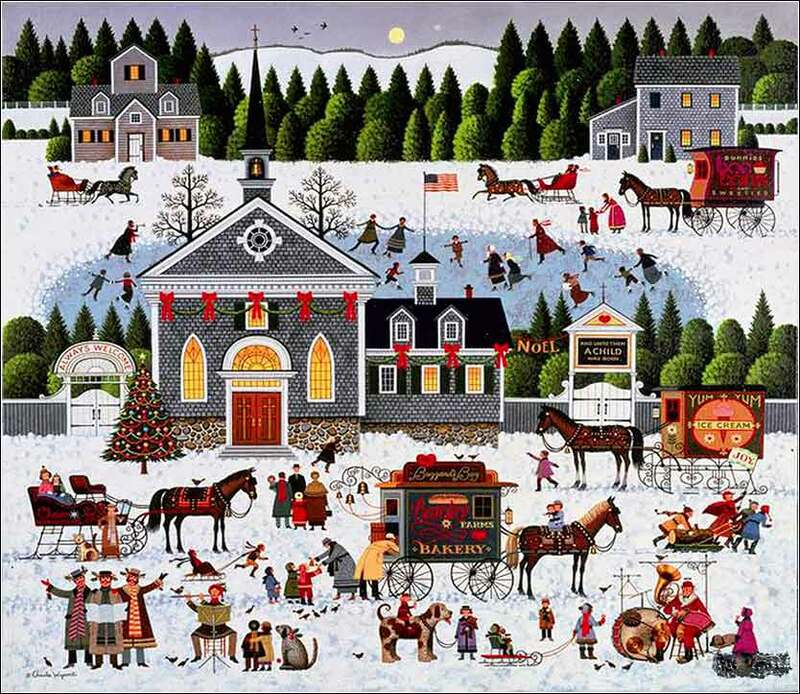 Churchyard Christmas by Charles Wysocki, ca. 1982. My brother, Jesus. It happens every year. I think that this will be the year that I have a reflective Advent. I look forward to Sunday and this new season, Jesus. But all around me are the signs rushing me to Christmas and some kind of celebration that equates spending with love. Alpha is the first letter of the Greek alphabet (almost identical to the English “A”), and Omega is the last letter (the capital “Ω” is most common, but in case you're interested, the small letter is “ω”). Saying that I am the “Alpha and Omega” is a poetic way of restating that God is the very beginning of all things and will be the very end. There was nothing before Him, and there can be nothing after Him, because He is eternal. Mostly we say simply that God is eternal; He always was and will always be. Most Christian theologians consider that God exists outside of time, and in fact created time, something that we can say but can only partially grasp (unless we want a really bad headache). But we, who exist within time and space, can pretty well grasp that God existed at the very first instant and will be until the very last; He was the beginning and will be the end. The beautiful hymn highlighted in our devotional today, which prominently includes the phrase “He is Alpha and Omega”, is a remarkable work. The tune is recognizable as Gregorian chant and was actually written at least 1,000 years ago: The first written copy of the tune has been dated to the 11th Century. It was titled Divinum Mysterium (divine mystery) and it really does have a beautiful, mysterious, and spiritual effect on the listener. It is sung here exactly as it might have been sung a thousand years ago, by an a capella male choir. There is some modern harmonization towards the end, but much of the performance is sung in ancient monastic style (developed long before the musical revolutions of renaissance and baroque stying): in unison, in unison with a drone note, or in eerie sounding two-part harmonies. 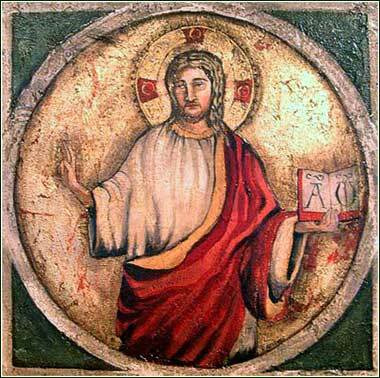 Alpha and Omega became a common Christian symbol in the early days of the church; like the fish, it was often used by Christians in areas where they were persecuted, and the authorities would immediately recognize a cross and investigate to identify Christians in order to arrest them. The ancient Roman tile (on the left) shows Christ holding a book in His hand, with the Greek letter alpha on one page and omega (a variant, using a large lower-case omega as the capital) on the other.